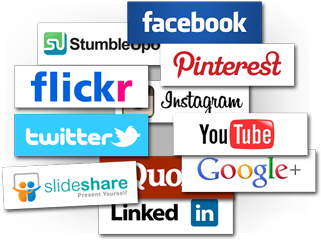 We help manage your profile across multiple social media platforms. Whether you feel enthusiastic or anxious there is no two ways about it, the fact remains that social media can be much more complicated than what it seems at first. Perhaps it is rightly said don’t judge a book by its cover. Taking a leap of faith without actual knowledge can turn out to be a rude shock. To create a social media marketing network which provides real value requires one to be tech-savvy and persistent, but fear not – we’re here to help! SMM the acronym for social media marketing, is a form of online marketing used to engage prospects by sharing relevant and high quality content in the form of videos, images etc. in order to accomplish the marketing communication and branding goals of an organization. A pre-requisite of social media marketing is knowledge of its fundamentals. This will not only lay a strong foundation to serve your target audience more effectively but also improve performance of your bottom line. Listen: In order to be successful at social media marketing, the first principle is to stop talking and start listening. Trying to understand the buyer’s mindset has always been a tough nut to crack. As an online marketer your best bet to spark a conversation with real value is to listen to your audience to understand and serve them better. Focus: It is frivolous to be jack of all trades and master of none. Adopt a rifle (bull’s eye) rather than a short gun (some hit most miss) approach to increase the probability of success of your social media strategy. Quality: It is better to have 1000 connections who actively talk and share content about your brand rather than having 10,000 connections who have simply connected to your brand online. Patience: Social media marketing should be seen as a long term investment which is likely to benefit in the long run. However, most business are skewed towards short term gains. Compounding: Creating and sharing rich content over a long period of time will have a ripple effect i.e. go viral and open new avenues of business opportunities. Influence: Identifying influences in your market and winning them over on your side with authoritative content could help you reach a wider audience. Value: Spend more time on creating informative and helpful content rather than merely promoting your products or services else people will stop listening after a certain point of time. Acknowledgement: If you met a person face-to-face would you avoid or respond to them? Surely, you would reply to them. So why is it a different approach for a person who reaches you online? Building relationships online is a cornerstone of social media marketing success. Accessibility: Your followers online can be fickle minded and in the blink on an eye your brand can be replaced with your competitor. So not only build but also participate in conversations rather than merely publishing content and vanishing for months. Reciprocity: You shall reap what you sow. Spend some time to speak about content published by others first only then will they be happy to repay the favor. Why should a business invest in Social Media Marketing? No matter the scale of your business today, be it small, medium or large the truth is that today your customers are online. They interact with their friends, peers and brands in quest of information, reviews and entertainment. If your firm is not around to answer, a lurking competitor is likely to swoop in and seize the opportunity and then there would be no point in crying over spilt milk. Build relationships online in order to lay a foundation for your most valuable asset in future – Your customers. Utilize this opportunity to bond with your audience and get to know them better than ever before. Expand your reach, engage prospects, drive qualified traffic, increase your brand authority and gather data needed for insightful business decisions. Maybe the real question is – Why wouldn’t you use social media? And who better than Wikipedia to tell you the exact importance of investing in social media marketing. Decide the ideal social media channel to build your brands online presence. Understand your target audience and engage them more effectively. If your objective is to raise brand awareness you would like to take into consideration sharing blog articles, info-graphics, short videos etc. If your objective is to maximize conversions, you would need to identify and engage the niche audience who is ready to “buy” what you have on offer. Your social media engagement efforts have to be focused in the direction of achieving the primary objective. Facebook: From connecting friends and relatives, to plunge the gap between brands and its communities, Facebook has taken online interactions to new heights. Facebook has a casual and a friendly environment. Don’t be afraid to have a little fun on this platform. It is an ideal platform to humanize your brand. Post timing is a critical success factor. Ask an athlete the value of each second, similarly scheduling your posts at the time to connect with your target audience when they are most active is crucial. You need to adopt a proactive approach to moderate content on your page. You need to be quick witted to decide whether to address negative comments or simply delete posts e.g. in foul language, offensive etc. from your page. Avoid grammatical and spelling errors. Ensure your facts are from credible sources. Be tactful with your posts. Facebook has its own set of algorithms to detect spam and could lead to banning your account from Facebook. Timely responses are crucial. Never make the blunder to let your audience feel that they have been forgotten. Unlike traditional forms of communication you need to respond faster. If possible revert to your audience within a couple of hours. Do not post more than three posts a day on Facebook else it could annoy your target audience. Many social media tools offer the functionality to post from the tool to Facebook however it is recommended to post from the interface of Facebook itself for better results. You have to be concise yet informative in your tweets within the limit of 140 characters. Respond swiftly to your followers else you may end up going viral for all the wrong reasons. Ensure your profile is updated as it creates a good first impression and adds credibility to your brand – This could be a factor to help you gain many followers. This may be repetitive although it is crucial for the image of your brand – please don’t spam. If your tweet begins with @username, only people who follow both you and @username will be able to view your tweet. If you want more people to see it, just add a period before the username. Use #hashtags to expand your reach to a wider audience. #Hashtags intend to tell your audience what your tweet is about. Shorten your links when you tweet. Google+ community has a tendency to respond better to images. Photographers we hope you’re listening. As Google+ has a growing community which is smaller when compared to other social media platforms like Facebook or Twitter finding influencers, gaining attention and building relationships is comparatively easier. Don’t be afraid to share your Google+ page on other social media platforms. Format your posts to draw attention of users to your posts and give it a professional touch. If you want to find another Google+ page or person append a + and then type the brand or persons name in the search bar. You may want to use Google Chrome extension Do-share or 3rd party tools such as buffer etc. to schedule your posts since Google+ does not have the feature to schedule posts at this time. However be cautious as not all tools allow formatting of posts. Complete your profile and company page information honestly. Follow competitors to keep track of their updates. Participate in Groups to build authority. Personalize your interactions rather than sharing updates addressed to all. Leverage the power of recommendations to show off your expertise – but be careful you don’t overdo it. Content you share on LinkedIn has a direct implication on your professional attitude and reputation – hence choose wisely what you wish to share. Link your Google+ brand page to the YouTube account of your brand. Instructional videos, guides and how-to videos have a proven track record for enhancing engagement. Moderate videos which have comments enabled in them to eliminate spam comments and ensure your audience is engaged. Ensure a consistent brand voice across all your comments to foster credibility in the mind of your prospects. Advertising although can be a source of income however it has a tendency to hinder the user experience. You need to walk on a tight rope and tread carefully. When you upload a video to YouTube be sure to provide maximum possible information such as title, description, keywords, category etc. to boost the visibility of your video and complement your seo efforts. Let us consider an example of a photography business. What would be an ideal social media platform for such a business? Ideal social media platform: Instagram – since it is a website specifically designed for sharing photographs. Once you are on social media you may find yourself getting distracted frequently with emerging apps, tools and features. It is crucial that you keep pace with emerging trends but at the same time not lose track of your online marketing goals. Followers/Fans: It is heartwarming to see this number grow however if not complemented with other parameters it becomes merely a number and is pretty much meaningless. Engagement: This is probably the most important metric since it indicates how well your brand is performing on social media and how people respond to content posted about you. Click through rate: As an online marketer you are aware of this metric for sure. This is significant when your objective is to drive traffic and subsequent conversions. The first step of your social media plan should be to get people to like you, irrespective of the social media platform. When people who like you have their expectations met over a period of time, you have accomplished some degree of engagement with them. Just like a human relationship involves forming bonds and mutual agreement to move to the next level, the same holds true for the bond between your brand and your audience. You should focus on creating positive experiences that are in the interest of both your audience and your brand. The last level and the ultimate dream of any social media marketing strategy is to foster such a relationship in which customers are willing to take up arms to defend your brand. Here the community takes it upon themselves to defend your brand rather than you having to dirty your own hands. It is a stage in which you get the reward for all the effort and hard work you put in. Now you have a brand advocate defending you when you may not be present. Being a social media marketing company and an expert in this domain, we have researched and found out that 81% of consumers are influenced by what their friends post on social media platforms while making a purchase decision. You can adopt the archaic approach and toil to make both ends meet by indulging in activities that wail for attention. But in reality, they are simply empty vessels that make the most noise and produce no results. So it’s rather better to embrace social media networking to engage your prospects and build collaborative relations with the help of a social media marketing company like ours. At Dharne we breathe life into your social media marketing campaigns and you can leverage our domain expertise to get scalable solutions for your business. Publishing updates regularly based on content provided by you. Designing Avatars, Backgrounds, Logos and other images to display within your profile. Integrate Facebook Connect, Google Connect, social media marketing links with your website. Extend our Search Engine Optimization(SEO) services to include elements of Social Media Marketing(SMM). Over the years we have successfully served clients from different business domains in reputation building and increasing brand awareness. We have conducted an in-depth analysis on the various online social media elements and understood the requirements to make you stand out from the crowd. Today, customers utilize the web for almost everything right from shopping, finding information, sharing experiences and so on. Social media marketing & websites prove helpful to interact with your customers, provide feedback, and act upon suggestions. Contact us and we will build the perfect social media marketing campaign for you which will benefit you in the long run.